A free-to-play fantasy MMORPG allows players to defend the world of Aeos, a realm under threat from the emerging Demons that wish to bring forth the final battle and eliminate the living races and bring in an era of upheaval and darkness. With an in-depth list of available features focused on PVP and PVE, players will train up to become mighty Heroes, learning new powers and abilities and acquiring powerful magic items and artefacts to aid them in their battle against evil. 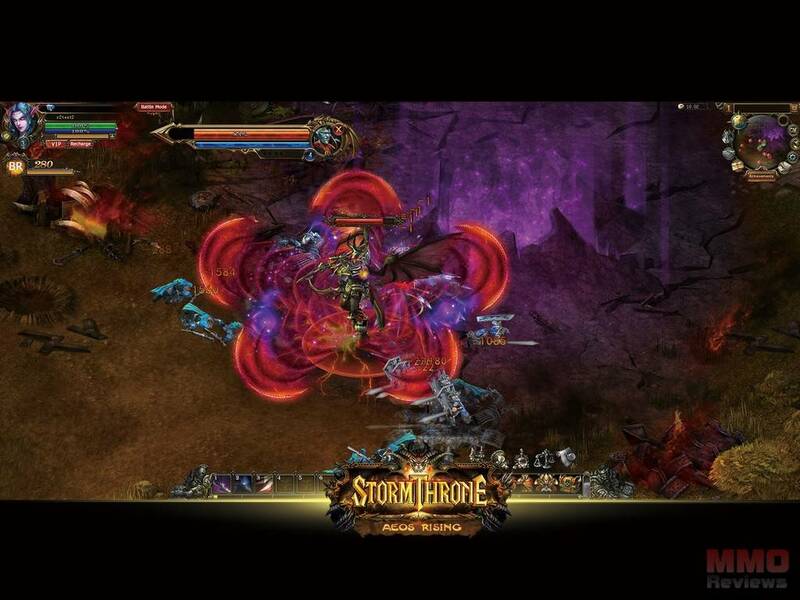 Stormthrone is a browser-based MMO RPG and can be played directly through your preferred web browser without any need of a client download and has a quick and easy online registration process to create an account. The world was created by the Trium; Umbral, Beruva and Tem, forged with war they battled to earn the freedom of the Driftworld from which they created Aeon. Over the millennia, beneath the surface dark powers have plotted revenge and the one known as the Voice Below has amassed an army of Demons at an unprecedented scale and now prepares the final war to destroy the surface dwellers and worshippers of the Trium. In Dawnhold, men and women have begun to show abilities that were thought beyond mere mortals, this new generation has begun to birth Heroes that have mastery over the arcane elements and may be the last hope and salvation in the battle against the dark. A traditional MMORPG that focuses on story content with a variety of quests, PVP arena style combat, multiplayer dungeons that will require groups of players to work together cooperatively to overcome the challenging AI threats within. Players will advance their heroes, unlocking new skills and abilities and over time equipping themselves with gear and the ultimate weapons: the Aeon Weapons. The Mage - a powerful practitioner of the arcane arts able to harness the destructive powers of the elements and wield them in battle; though physically weaker than other combatants, they more than make up for it with their powerful long ranged spells. The Priest - able to support their allies and offer protection gained from the Axiom, they are the ultimate bane against the Demons that threaten the world; focusing on the holy light and drawing their strength from the gods they serve, they are a force to be reckoned with. The Paladin - giving their worship to the Goddess of the Sun, Beruva, these holy warriors fight for justice, righteousness and in the defence of humanity against the dark plate that sweeps across the lands. Using sword and shield and their holy light, they are the defenders of the weak. The Hunter - connected to all the living beings on Aeon, they are at one with nature and directly opposed the blemish and corruption that the presence of the Demons have wrought upon the land and now fight to return the balance as much as to save humanity. The Warrior - aggressive, brutal and devastating in battle as they charge into the fray wielding colossal weapons of destruction; their way of combat may not be the most refined and lacks in elegance, but the carnage that they can unleash has made them a worthy and much feared opponent. The Rogue - striking from the shadow, timing their precise critical strikes for maximum efficiency, these agents of the night prefer stealth and subterfuge, giving them the edge over single and multiple opponents. They are proof that there are things that dwell in the darkness worse than Demons. Once wielded by the gods themselves in the battle to forge Aeon, these ancient relics once thought lost have now begun to re-emerge and once more find themselves in the hands of the worthy; Heroes that look use them in their cause and fight back the agents of the Voice Below.